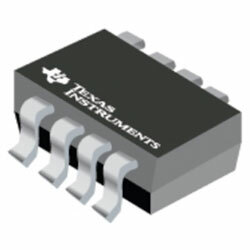 Texas Instruments TMUX6119 36V Precision SPDT Switches operate well with dual supplies (±5V to ±16.5V), a single supply (10V to 16.5V), or asymmetric supplies. The switches provide dual digital input pins (EN and SEL) with transistor-transistor logic (TTL) compatible thresholds, assuring both TTL/CMOS logic compatibility. The device can be enabled or disabled by controlling the EN pin. When the device is disabled, both channel switches are off. When the device is enabled, the SEL pin can be employed to turn on channel A (SA to D) or channel B (SB to D). The device features BBM switching action. The device features very low leakage currents and charge injection, allowing the device to be utilised in high precision measurement applications. Also, the device offers superior isolation ability by blocking signal levels up to the supplies when the switches are in the OFF position. The low supply current of 17µA allows the use of the switch in portable applications.